I used to make california maki at home, then kani salad when I realized it was much, much easier. Shred the crab sticks, add in sliced mango and cucumber, drizzle some mayo and mix! If needed, you season a bit with salt or sugar. And it was easy. Last night though, I was really craving for some kani salad. Like really craving. It was late, I haven’t had dinner. I could have gone home and just ate the food at home, but I couldn’t. So I passed by the supermarket, bought some crabsticks and breadcrumbs and was excited to go home. 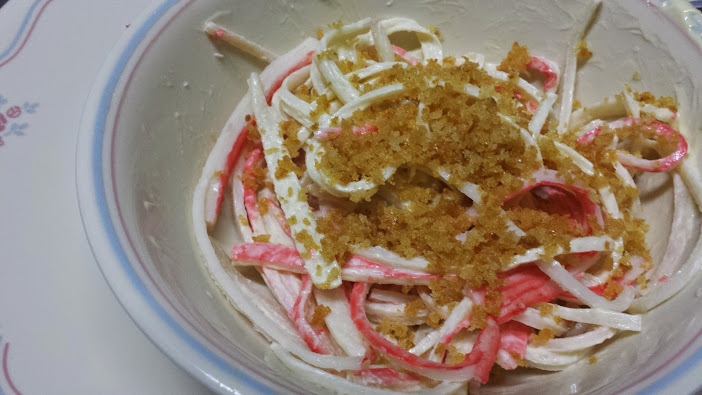 So as soon as I got home, I defrosted the crabsticks in the microwave, topped it with mayo, then topped it with crunchy breadcrumbs toasted in some sesame oil.